Sometimes, after a long day, the last thing you feel like doing is cooking or making a meal from scratch, but funnily enough that's one of the reasons we're so excited about a campaign we've recently created for Winn-Dixie. Why? Because it shows just how easy it can be to make great family meals that everyone will love. We're definitely feeling inspired to make lasagne for dinner one night when it's as simple as this... and inspiring customers to create something new is exactly what we set out to do, when we created a series of these short video recipes for Winn-Dixie - encouraging people to bring 'The Taste of Italy' into their own homes. Quick and simple recipes showing all the ingredients you need for mouthwatering Sausage and Peppers, Bruschetta and Affogato , and the easy step-by-step ways to make them, were also added to the Winn-Dixie Instagram and Twitter feeds, encouraging us all to 'take in' rather than 'take out'! The videos also suggest taking a screenshot, so you can refer to the featured recipe later and have an instant shopping list on your mobile... now that's a cool idea, even if we say so ourselves! And that's not all. In store, we created a real sense of event, making it easier still for customers to get involved and feel inspired. 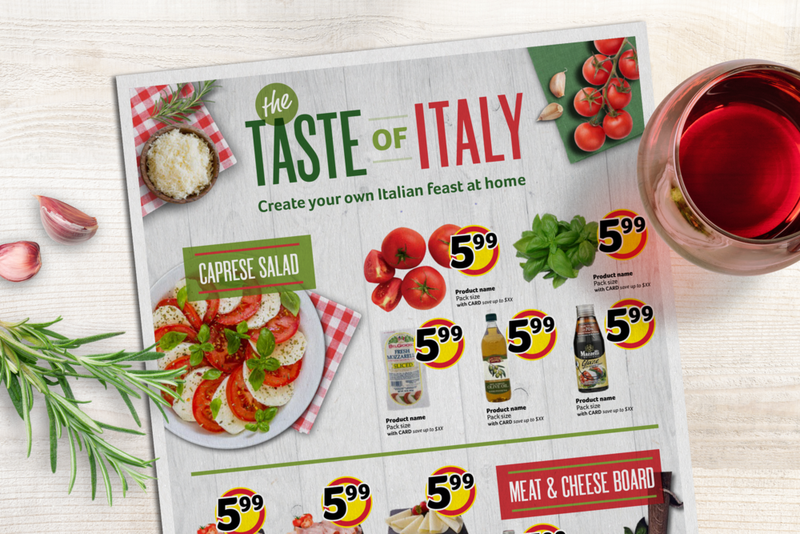 'The Taste of Italy' campaign identity and point of sale brings fresh Italian flavors to life, with colour and energy. Beautiful food photography highlights the quality of the ingredients and our invitation to "create your own Italian feast at home" definitely seals the deal! From in-store design to direct mail deal, printed recipe leaflets and social media campaigns, our consistency of message and appealing campaign creative reached customers across a number of different touchpoints, inspiring them to shop at Winn-Dixie and try 'The Taste of Italy' for themselves.